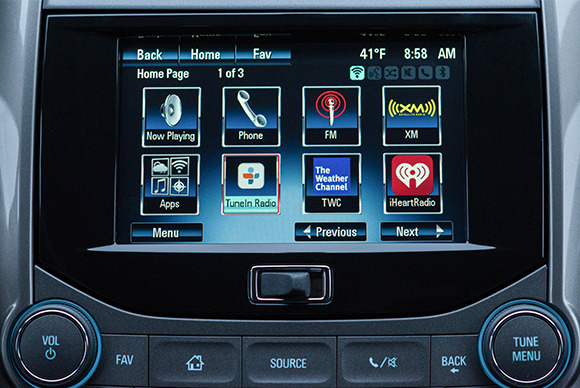 Chevrolet’s Spark and Sonic cars are getting some new apps in their MyLink infotainment systems. The apps include TuneIn radio, an Internet radio app that lets you stream local radio stations from around the world, as well as Siri integration (for iPhone users with iOS 6) and BringGo, a full-function navigation app. The big announcement for CES is the TuneIn radio app, which will be available in Chevy’s Spark and Sonic lines this year. TuneIn radio is not your typical Internet streaming radio app—instead of simply streaming Internet radio stations, the app lets you stream local stations from around the world. So if you’re a Detroit native driving in Atlanta, you can find your favorite at-home radio station and listen to it on-the-go. Heck, this would even be helpful for people in closer ranges—my San Jose country music station stops working when I hit San Francisco. Since it’s a global app, it also offers local stations from other countries, which is nice for out-of-towners who are homesick. TuneIn, like other Internet-connected MyLink apps, uses your smartphone’s data plan. Chevy’s MyLink connects to your smartphone (iOS, Android, BlackBerry, and some Symbian and Windows Mobile devices) via Bluetooth or USB wire, and uses your phone’s data plan to connect to the Internet. This might be a problem with streaming radio, since most people’s data plans aren’t unlimited and streaming audio can quickly burn through your monthly data quota. Chevy is also showcasing the Spark and Sonic’s Siri integration. These vehicles are the first vehicles to have built-in Siri integration, or a one-touch Siri button located on the steering wheels. The cars’ Siri integration lets users activate Siri and perform some basic tasks through the cars’ voice-activation system. Siri integration works via Bluetooth, and is available for users who have iPhones running iOS 6. Drivers can ask Siri (through their car) to make phone calls, write text messages, change the radio station, and make calendar appointments. Drivers cannot ask Siri to perform tasks that would require pulling up a Webpage, because such tasks would be too distracting. Chevy first demoed the Spark’s and Sonic’s Siri integration at the Los Angeles International Auto Show in December. Finally, Chevy is also adding BringGo app integration to its Spark and Sonic MyLink infotainment system. BringGo is a full-function navigation system with features such as points of interest, local search (via Google), and 3D maps. It’s a smartphone app, and it costs about $50 per device, but it offers Spark and Sonic users the option to have a full-function navigation system without the extra cost of an actual navigation system. What’s cool about the MyLink infotainment system is not necessarily its app and Siri integration, but the fact that it’s offered in entry-level vehicles such as the Spark and the Sonic. At the Los Angeles International Auto Show, General Motors announced that the 2014 Spark EV will be available in summer 2013 for less than $25,000 (with tax credits).